The stuntman who parachuted in to the London 2012 opening ceremony as James Bond has been killed in an accident. Mark Sutton, 42, from Surrey, died while wingsuit flying near Martigny, Switzerland, on Wednesday. Swiss police investigating the Briton's death said it appeared he had died after crashing into a ridge of rock. 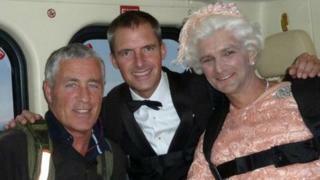 Mr Sutton doubled for Daniel Craig's James Bond as he and a stuntman playing the Queen jumped from a helicopter over the Olympic Stadium last summer. Wingsuit flyers wear special suits that are designed to allow them to glide through the air at high speeds, before a parachute is opened for landing. Mr Sutton, a former army officer, jumped from a helicopter flying at 3,300m (10,800ft) with a fellow wingsuit flyer - described by police as a "close" friend. They had intended to descend close to the mountainside and land at a village just across the border in France. Mr Sutton had reportedly been staying in Chamonix with his partner. Jean-Marie Bornet, from the Valais police service, said the Briton was the first wingsuit pilot to die during a jump in the region. "The weather was good but when a pilot takes part in this sport, the aim is to fly very close to the ground or mountain side," he said. "If you do this at speeds of 200km/h (125mph), the margin for error is very small." The stuntman had been invited by Epic TV to take part in the three-day wingsuiting event with about 20 other experienced flyers, who were to be filmed on their descents. Trey Cook, editor-in-chief at the company, described the incident on the first day of the event as "devastating". "It was a really casual event," he said. "They had gone up in helicopters and they were jumping. They were choosing their own courses. We were filming them as they were flying." He said the stuntman who jumped with Mr Sutton had had a camera to film the descent. Police are studying video footage of the jump, but Mr Cook said the moment of impact was not captured on film. Epic TV make "extreme sports" videos for broadcast online. In a statement, it added: "Rescue services arrived quickly and determined that Mr Sutton had immediately died upon impact. "Mark Sutton's death is a tragic loss for the global wingsuit community. Our thoughts and prayers go out to his family and friends at this time." Stuntman Steve Truglia told the BBC there was a growing trend for wingsuit pilots to fly extremely close to the ground, mountains and cliffs. He added the practice was at the "cutting edge" of the sport. "It's quite normal for those of us that do those kind of sports to want to push things a bit and sometimes your luck runs out." Gary Connery, the stuntman who played the Queen during the Olympic ceremony, tweeted what appeared to be a grieving message following his friend's death. He wrote: "All you jumpers/flyers out there, stay safe, make wise choices and know your limits and your locations. Live to tell your stories. One love." Danny Boyle, who directed the opening ceremony, told the Evening Standard that Mr Sutton had been a "gentle and thoughtful" man and his death would be "a huge loss to his profession". "The show was built from so many contributions from so many people, none finer and braver than Mark Sutton's," he told the newspaper. "On behalf of everyone in the show, we were all honoured to have worked with him and to have known him as a friend and a professional. "All our thoughts are with his family, friends and colleagues." Lord Coe, who chaired the committee that organised London 2012, said he was "shocked to hear the desperately sad news". The peer, now chairman of the British Olympic Association, said: "The cast and volunteers in London became a very close-knit family. We are all thinking of Mark and his family at this incredibly difficult time. "Mark was a consummate professional and team player. He will be widely missed."